Gavriil Tikhov was a pioneering Russian astrophysicist and astrobiologist. He was born on May 1, 1875 in the village of Smolevichi near Minsk (Belorussia) in the family of a railway employee. After four years training at Moscow University, which he finished in 1897, Tikhov married Ludmila E. Popova and continued his education at the Sorbonne in Paris. There he met the Russian astronomer A. P. Gansky, with whom he made an ascent of Mont Blanc, and the director of the Meudon Observatory, J. Janssen, one of the fathers of modern astrophysics, famous for his studies of the Sun. On Janssen's advice, Tikhov made a balloon flight, together with several French astrophysicists, to observe the Leonids meteor shower in November 1899. After returning to Moscow and earning a master's degree, Tikhov was invited in 1906 to Pulkovo Observatory near St. Petersburg by one of the pioneers of astrospectroscopy, A. A. Belopolsky. At Pulkovo, Tikhov investigated various optical phenomena in the Earth's atmosphere, made observations of the planets, and carried out photometric studies of the stars in "Kapteyn's squares" – selected sky areas where the physical properties of stars were researched to draw a conclusion eventually on the structure and characteristics of the whole Galaxy. Tikhov originated the idea of the "feathering spectrograph." Most glass lenses show the effect of chromatic aberration, in which rays at different wavelengths from a star are not focussed at a single point on a photographic image but instead form a round halo. Tikhov installed a special ring-shaped diaphragm in front of the astrograph objective to enable the brightness distribution along the radius of such haloes to be studied and so provide data on the color distribution of stars of different spectral classes. Tikhov's work on phenomena in the Earth's atmosphere included measurements of the polarization of the day sky and spectrography of star-twinkling. He developed a number of new instruments for such observations and helped establish some of the central principles of practical photographic photometry. These are described in the chapter on astrophotometry in the first edition of the Pulkovian Course of Astrophysics and Stellar astronomy (1922). After being conscripted by the Soviet army in 1917, Tikhov applied his knowledge of the visibility of distant objects to aerial photography, and published what is perhaps the world's first monograph on the subject, "Improvement of Photographic and Visual Air Intelligence." In 1919 Tikhov lectured on astrophysics at Petrograd University to an audience which included some famous future names, including Victor Ambartsumian, N. Kozyrev, V. Tzesevich, and V. Nikonov. Tikhov was among the first to apply colored filters as a means of increasing the visible contrast of planetary images. Beginning in 1909, he investigated Mars in this way using the 30-inch refractor at Pulkovo Observatory. At that time it was popularly believed that the dark areas on Mars were regions covered by vegetation. Consequently, many attempts were made to detect the characteristic absorption band of chlorophyll in the spectrum of light from the planet. 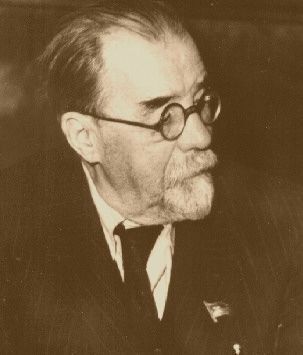 In 1927 Tikhov was elected as an associate member of Academy of sciences USSR. In 1941, in spite of the Second World War, the planned expeditions of number of astronomers from Moscow and Leningrad to Alma-Ata for the observations of total solar eclipse 21 September went ahead. Alma-Ata became practically a place of evacuation for many scientists and other academics from western parts of Soviet Union. After the War, not all the displaced astronomers returned to their former places of work. Among these was Tikhov who, together with other scientists, helped found the Academy of Sciences of Kazakhstan and became one of its first academicians. Thanks to the efforts of Tikhov and academician V. G. Fessenkov, supported by the first president of the Academy of Sciences KazSSR K. I. Satpayev, astrophysics took root in Kazakhstan. A serious observational base developed for different topics in astronomical and astrophysical observations. Tikhov was appointed head of the Sector of Astrobotany, set up to investigate the possibility of life on other worlds in the Solar System. His observatory was equipped by Bredikhin's astrograph, brought from Pulkovo, and later by a 20-cm Maksutov meniscus telescope, suitable for expeditionary work and used intensively for photographic and spectral observations of the Moon and planets. In 1964 (after Tikhov's death) a new 70-cm telescope, ordered by Tikhov and designed specially for planetary observations, was set at the mountain observatory of the Astrophysical Institute. Researchers in the Sector of Astrobotany – mostly young graduate students – carried out many studies of the optical characteristics of terrestrial plants, including expeditions to regions with extreme climatic conditions, such as the high Pamire mountains in the subarctic tundra. The object of these studies was to discover how the low-temperature, high-altitude regime, and oxygen deficiency in partyicular, affected the optical spectra plants. Evidence was found that under in such a regime the chlorophyll absorption band becomes more extended or disappears completely. This was used to counter the argument against the existence of Martian vegetation based on the observed absence of chlorophyll absorption in the maria spectra of Mars. Tikhov hypothesized that as a result of adapting to the harsh climatic conditions of the Red Planet, Martian plants absorbed solar radiation at different wavelengths than do their most of their terrestrial counterparts. Indeed, Tikhov was a form opponent of geocentrism, insisting that life on other worlds might be very different from the forms with which we are familiar here on Earth and could appear under very different conditions – a view now commonly held by many scientists. After Tikhov's death in 1960, the Sector of Astrobotany was broken up. Its astronomical work was taken over by the Astrophysical Institute, headed by V. G. Fessenkov, where it continues to this day. Soviet research in exobiology and space medicine became focussed in organizations concerned with the development of astronautics. Recent developments in astrobiology, such as the possibility of that life might exist on the icy satellites of Jupiter have shown just how advanced were the ideas and concepts promulgated by Tikhov half a century back. The results of Tikhov's astrobiological work and of the Sector of Astrobotany are contained in several volumes of Proceedings of the Astrobotany Sector, monographs and dissertations, in Tikhov books Astrobotany (1949) and Astrobiology (1953), and a five-volume collection of Tikhov's papers. Other details about Tikhov's life and work are described in his autobiography Sixty Tears Beside the Telescope(1959) and A. K. Suslov's book Gavriil Adrianovich Tikhov (1980). Thanks to Professor Viktor Tejfel of the Laboratory of Lunar and Planetary Physics, Fessenkov Astrophysical Institute, Alma-Ata, Kazakhstan, for the information on which this article is based.